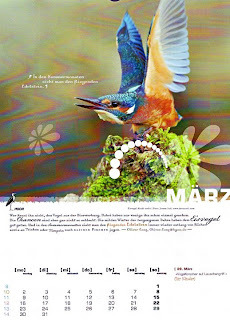 One of my Kingfisher images was published in the 2009 calender of the HGON wich stands for Hessische Gesellschaft fur Ornithologie und Naturschutz. They are a German Bird Conservation group and i am delighted to be in their calender amongst some of Germany's best nature photographers. The website for HGON is www.hgon.de for thos of you who are interested in their activities.